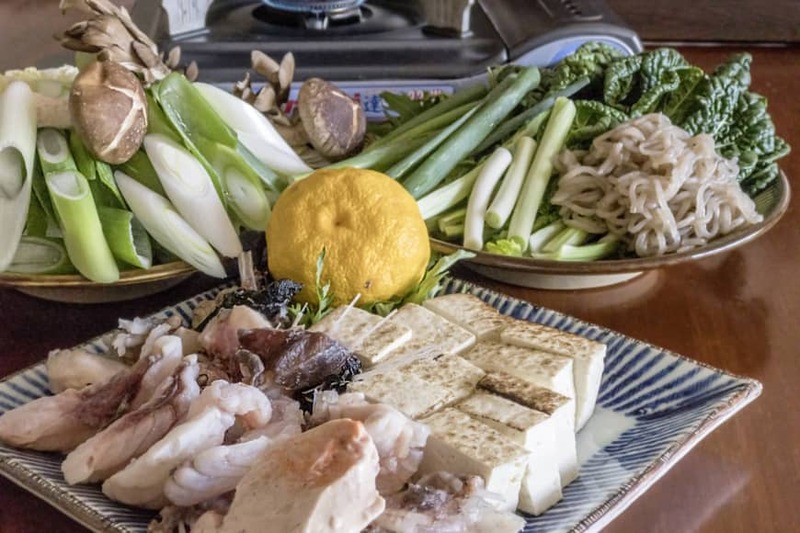 Japanese nabe (hot pot), a dish where raw ingredients are cooked in a pot in front of the diner and eaten as each item cooks through, is the ultimate comfort meal on a cold winter night. Nabe is warming, hearty and packed with vegetables and protein, which makes it healthy to boot. Most of all, it is really easy to prepare, even for the inexperienced cook. In most cases, all you need to do is some cutting and chopping before bringing everything to the table. The actual cooking itself becomes a fun group activity instead of a tedious chore. Nabe cooking as we know it today got its start in the Edo Period (1603-1868), when hot pot meals were cooked on sunken open hearths called irori. However, this kind of cooking never really caught on in Edo and other urban centers (although some restaurants offered single-serving nabe) since open-hearth cooking was a fire hazard. While certain types of nabe such as gyū-nabe (beef hot pot) came to embody the new, Westernized way of eating in the Meiji Era (1868-1912), nabe cooking at home really took off in the mid-20th century with the introduction of tabletop cookers powered by safe, portable and inexpensive gas canisters similar to those used for camping. 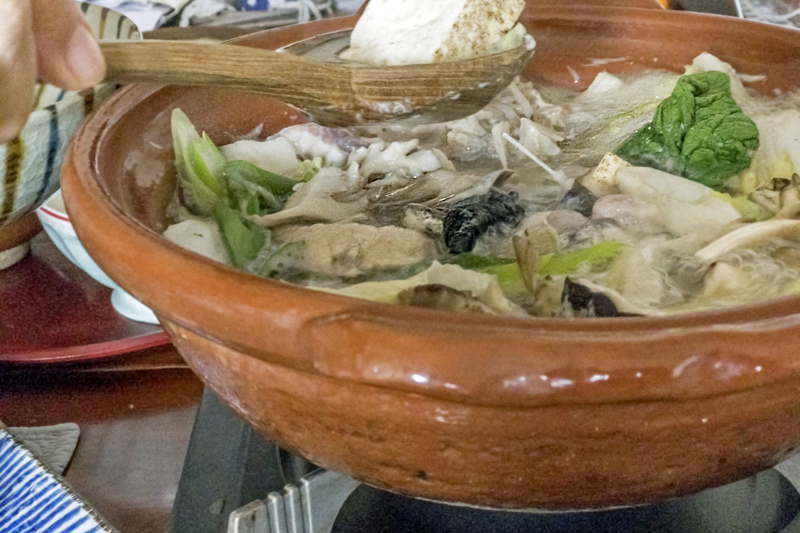 Although there are all kinds of nabe, many of the ingredients are essentially the same. The base is a flavorful, umami-packed soup or sauce, which may be sweet as well as savory. There is at least one protein, which can be any combination of meat, fish, tofu or other things. And there are always tons of vegetables, which are consumed along with the soup. The carbohydrate portion of the meal, called the shime (ending), is usually eaten as the last course: this is usually noodles or rice cooked in the flavor-packed soup with any remaining protein and vegetables. All you need to get started on your nabe-making journey is a pot, preferably an earthenware one since it retains heat well, and a tabletop cooker. A good gas canister-powered cooker only costs a few thousand yen. You’ll also need some tonsui shallow bowls for each person. 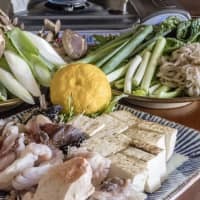 This recipe is for a type of nabe that requires a little prep work, but it’s one well-worth trying, especially since monkfish is in season in January and February. If you can, try to find a packaged set called the “seven tools” (nanatsu dōgu) which consists of the flesh, bones and intestines of the monkfish all cut up and ready to go. 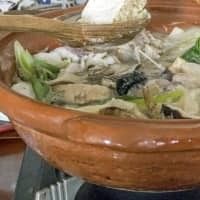 To make cooking nabe even easier, there are myriad commercial nabe soup bases available at the supermarket, although it’s quite simple to make your own. The night before, soak the konbu seaweed in the water and refrigerate. This will be the dashi base. Thirty minutes before dinner, generously salt the monkfish. Bring a pan of water to a boil and add the monkfish pieces. Boil for 20 seconds, then drain. Rinse the monkfish in cold water and drain well again. Bring another small pan of water to a boil. Drain off the water from the packet of shirataki noodles and add to the water. Boil for 20 seconds, then drain. Cut the noodles into easy-to-eat pieces with kitchen scissors. Roughly chop the Chinese cabbage and yukina greens. Cut the leeks into 5-centimeter-long diagonal pieces. Remove the stems from the shiitake mushrooms. Separate the maitake mushrooms into clumps. Drain the tofu and cut into 2-centimeter cubes. Place an earthenware pot on a tabletop cooker and add the konbu dashi. Turn the heat to medium and bring the dashi to a boil. Remove the konbu just before the water boils and add the sake and mirin. Then, add the monkfish, vegetables, mushrooms, tofu and shirataki noodles — you’ll probably need to add them about a third at a time. Each person can take out the pieces of food they want after they cook through, along with a little of the soup, adding some grated yuzu peel and yuzu juice to each serving. When all the ingredients have been eaten, add the frozen udon noodles as is, breaking them up if needed. Simmer the noodles until they are warmed through and eat with the remaining soup to end the meal.